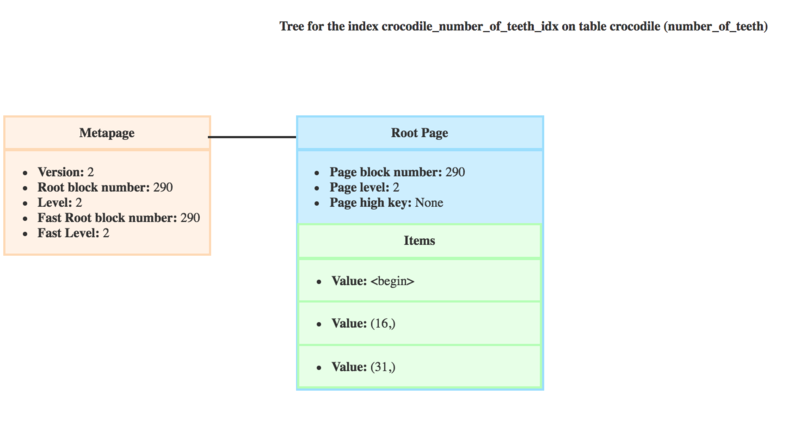 In the previous article, I introduced the internal data structure of a postgres BTree index. Now it’s time to talk about searching and maintaining them. I think that understanding this can help know when using a BTree makes sense and when it wouldn’t be very efficient. The scankeys are passed to the _bt_search function. Its purpose is to find the first leaf page where the scankey could be found. In order to explain the _bt_search algorithm, I’m going to use the following query. _bt_search initialize a page pointer bufP to the root or fast root. At this step, if we take my BTree, bufP would be on the root with block number 290. The second step is a loop iterating until the bufP pointer is a leaf page. Step 2.1: should I stop looking ? This way we have the path leading to the leaf page. Step 2.2: move right or not move right ? At this point the function _bt_moveright is called. It decides if it’s necessary to follow the right pointer of the current bufP page. This happens if, while descending on the tree, there was an insert. It could then be possible that the current bufP page was split. For example, the _bt_search for my previous query is looking for the first leaf page that could contain crocodiles with more than 20 teeth. The root doesn’t have a right page, so bufP wouldn’t change. It would then descend on the page 289 where the high key is 31 and the minimum value is 16 like you can see here. So the new bufP is the page circled in orange. You can see that the high key of the page 289 went from 31 to 19 and the page has a new right sibling because it was split. In this case, we know that the crocodiles with 20 teeth or more won’t be on the branch of the page 289 anymore, and the new bufPis set to the direct right sibling, so page with block number 840. The algorithm moves right if the page high key is stricly lower than the scankey. Once the possibility of moving right has been explored, we now want to look into the page items to find the children page to follow. At this point the function _bt_binsrch performs a binary search on the page’s items. If the page is not a leaf, it returns the offset of the last item with a value stricly lower than the scankey. So all the rows matching the clause can be found in the index after that item. Let’s get back to our index and the query. In a leaf page however, _bt_binsrch returns the offset of the first element with a value higher or equal than the scankey. I mentionned the fact that we put read locks on the currently examined page. This read locks ensure that the records on that page are not motified while reading it. Of course, it doesn’t mean that there is not a concurrent insert on a child page, which is why we still need to possibly move to the right page. Now let’s talk about inserts ! 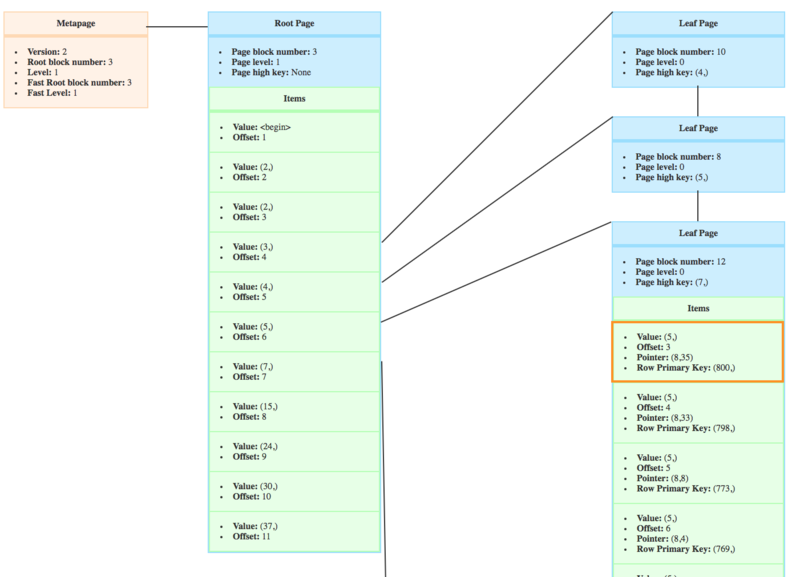 Inserting into a BTree reuses a lot from the seach algorithm, so I will mainly focus on page splits. In order to insert, scankeys are built. Then what we want is to find on which page our new tuple (key, pointer) should be inserted. Here there are two cases. Very often an index is on an auto-incremented value, for example the primary key I used for the crocodile table is a serial, and of course postgreSQL created the crocodile_pkey on its own. In this case a new key will always be inserted in the right-most leaf page. 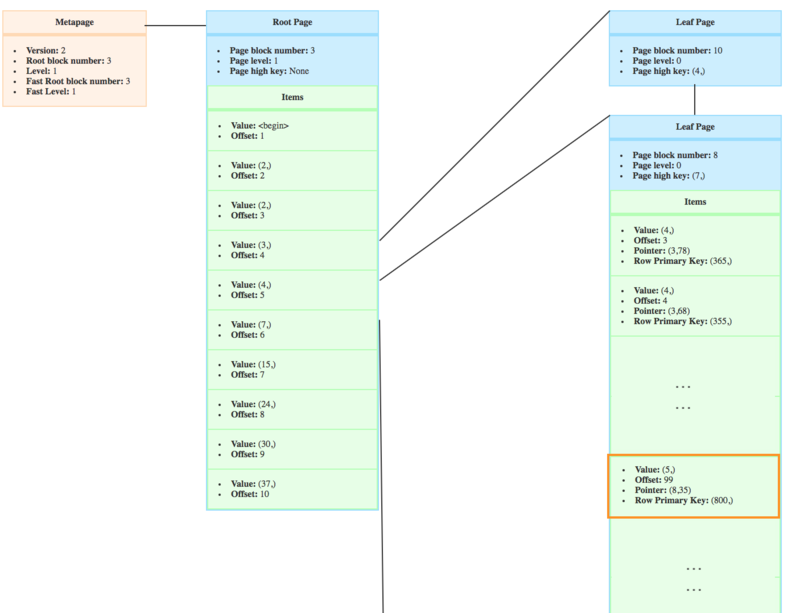 To avoid using the search algorithm to find the right page, postgres uses a fast path. The right-most leaf of the index is cached into a buffer. So we retrieve the page using this buffer. If this conditions are met, the fastpath variable is set to true. If the value of fastpath is false, it means that the indexes BTree has to be searched in order to find the right page for our tuple. The insert uses _bt_search to find the first page containing the key. It’s the function called to search in a BTree, see above. In the _bt_search we locked the page being red. Here we trade the read lock for a write lock. Step 3: move right ? It’s possible that, during the lock trade, the page was split. So as in the search algorithm, we re-use the _bt_moveright function to decide if it’s necessary to change the page to its right sibling. If we’re not allowing duplicates, postgres makes sure the key isn’t already in the index. Postgres can only detect that the value is not already in the index. So the write lock protects against concurrent writing on the page. The index has to be updated. 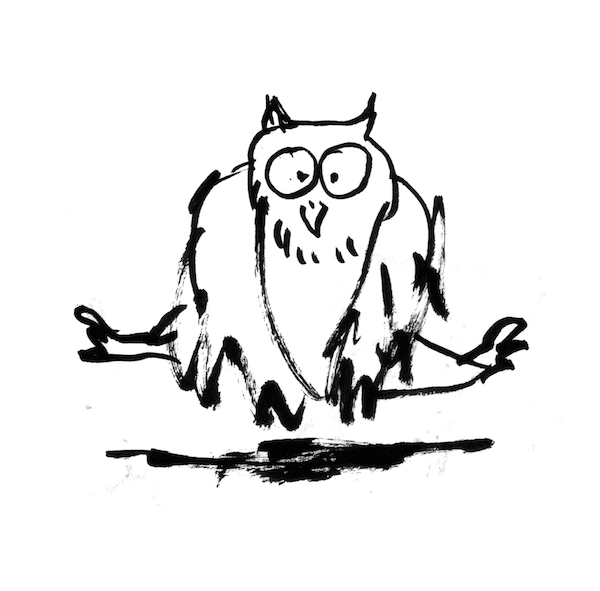 A write lock is aquired on the index page where the tuple (louise@croco.com and the pointer to the new heap) will be inserted. If there’s a concurrent writing, the second insert has to wait until the write lock is dropped. At this point the value louise@croco.com is already in the index. So there is a conflict and the new tuple can’t be inserted and as the operations of insert and updating the index are atomic, the query fails. The function _bt_insertonpg() inserts a tuple on the page previously found. The first thing that the function _bt_insertonpg() does is to check if the tuple can be inserted. It checks for example if the number of attributes in the tuple is appropriate. 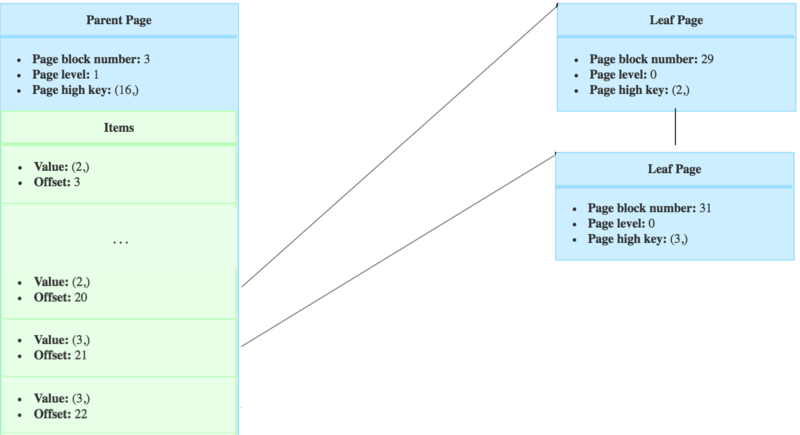 A page split occurs when there isn’t enough space to add the item in the target page, so a new page is created on the right of the page. On the following screenshot, you can see that a new page appeared on the right and the high key changed. That’s because of the page split. Step 1: is a split necessary? In order to decide if the page should be split, _bt_insertonpg() compares the size of the item that we want to insert to the free space on the page. If the free space is lower than the item’s size, then a split is necessary. You could think that it would be logical to simply create a new empty page and start filling it with the new tuples. But let’s look more closely at the page split after the insert of crocodiles. Focus on the first item of the new page. You can see here that it used to be in the target page. 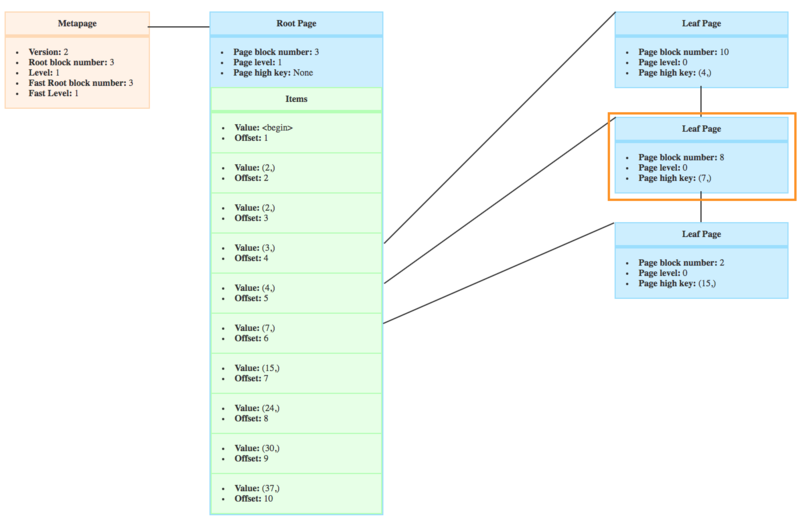 Which means that, when postgres performs a page split, it does not simply create an empty page ! 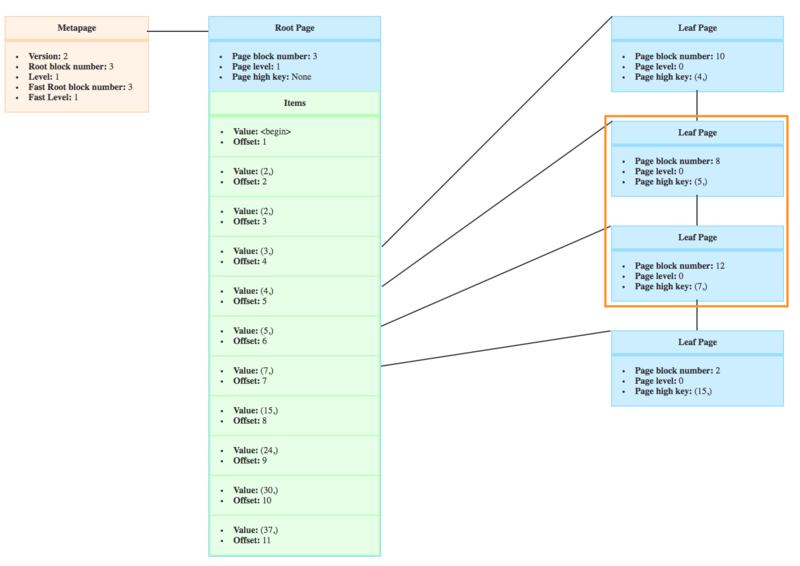 Postgres wants to equalize the free space on each page to limit page splits in future inserts. The goal being to limit as much as possible the number of pages in an index. 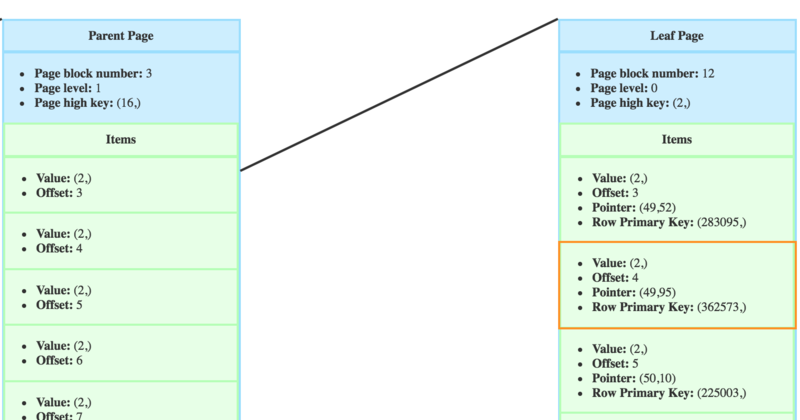 If it’s the right-most page on a level (so the last page of the level), instead of cutting in half, and having two pages with 50% of the data, the left page is filled as much as possible. It’s useful for serial indexes, like the index on the id of my crocodile table crocodile_pkey. There is no reason to insert data on any other page than the right-most page as it’s a serial integer. So when a page split is necessary, if the left page only had 50% of the items, it would be forever half empty. Which makes no sense ! So now that we have the split point. A right page is created. In the right page, the data after the split point is copied. The data of the target page is updated to only keep the data before split point. Then the pointers of the pages are updated. The right pointer of the target page becomes the new page. The right pointer of the new page is the old target page right pointer. At last the high key of the pages are updated. 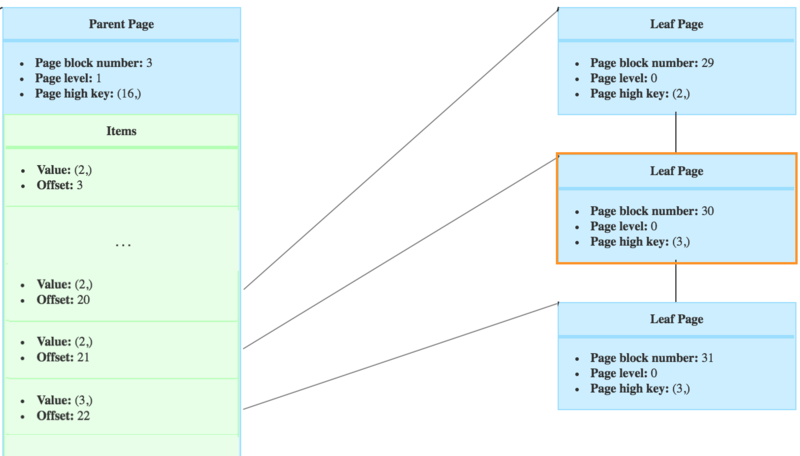 The high key of the new page becomes the high key of the splitted target page. The high key of the target page becomes the first value of the right page. If there was a page split, we need to insert the new page on the parent level. If the split page was the root, there is no parent, in which case a new root has to be created with items linking to the target page and its new right page. The metapage is updated with the new root. If it’s not a root, we need to insert in the parent page the tuple (value, pointer to new page). The value is the one from the first item of the new page. Thanks to the stack leading to the target page, we know in which parent page the tuple has to inserted. The function _bt_insertonpg() is called recursively with the parent page and the item. When we delete a row from a table, the index has to be updated. Which means that any tuple in the leaf pages leading to this row has to be deleted. The item is not immediatly removed from the index. It is first marked as deleted and will be ignored in index scans. The item still appears until the next VACUUM. The parents don’t need to be updated when deleting an item in a leaf page. The rest of the tree only changes in case of page deletion. A page is deleted only if all its items have been deleted. 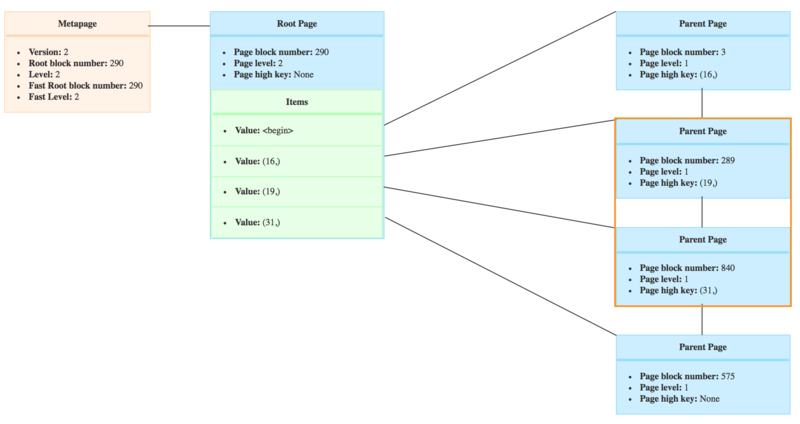 When a leaf page is empty, it is marked with a btpo_flag as half-dead. So any concurrent search will ignore it and move right. Then the page’s left page has to point to the page’s right page. If we deleted the page with block number 30. Then the tree would look like this. The new right sibling from page no 29, is the page no 31. The tuple that would have been inserted in page 30, will now be inserted in the right page. Once the links have been updated, the page’s btpo_flags changes to deleted. The page is marked as deleted, but cannot be reused immediately because their could be other processes using it. For example a search can be in the parent page and has to aknowledge the fact that the page is marked dead. A VACUUM will then reclaim the page under the condition that no processes is referencing it.. Once a page is free, it can be reused for a future page split and its content is overwritten. The parent need to be updated to remove the downlink to the deleted page. If the leaf page was the last child of a parent page, then the parent page can be deleted. This process is recursive until the first grand-parent with more than one child. The rightmost page of a level can never be deleted. This means that the height of a BTree can only grow. But if we delete a big amount of data, then it’s possible to end up with a tree with several levels with only one page. On the following picture you can see that my root only has one child. In this case, PostgreSQL updates the fast root of the metapage. The fast root becomes the first level with more than one child. In this case, the fast root is the page with block number 575. The fast root is used to optimize the search. Instead of starting from the root, it starts from the fast root, avoiding to climb down levels with only one child. The entire structure of a BTree and the algorithms used to search and update are based on the idea that we are comparing a scankey with >, <, >=, <=, = operators. This index is therefor efficient for this operations.